CEE Delhi organized a 'School Workshop on Waste to Wealth' in partnership with the International Centre for Integrated Mountain Development (ICIMOD). 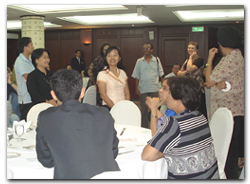 This workshop was a part of ‘Climate+Change’ Exhibition that took place at the Ministry of Environment, Forest & Climate Change from 11-14 December 2015. 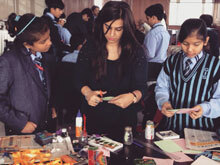 Nearly 150 students participated in the workshop and made products out of waste materials like Newspapers, cans, waste paper, tetra packs, straws, thrown away plates & cartons, CD's, thread, plastic bottles provided to them. Along with this, materials like paints, colored tapes, ribbons were also given to them. The students made the products like mats, baskets, bells, lamps, rotating bottle fan, flower pots, peacock from waste etc. 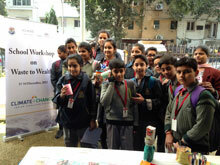 The students were guided by Ms. Prarthana Borah, Ms. Ritika Kapoor & Mr. Sanjeev Chauhan. 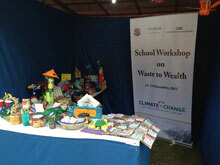 Waste products were then put at the CEE stall (Waste to Wealth) as an exhibit. The stall was visited by the Hon’ble Minister of State (IC) for Environment, Forest and Climate Change Shri Prakash Javadekar & Secretary (Ministry of Environment, Forest and Climate Change, Govt. of India) Shri Ashok Lavasa, IAS on 15th January 2015. The effort put in by the students was appreciated by both of them.